The Rumpshaker 5K is the largest free standing 5K in Alabama. This is our largest awareness and fundraising event each year and through it we have raised more than $1 million dollars over the past ten years to support the organization's mission. In 2014, we started a Corporate Awareness Campaign, "Rumpshaker at Work". This program is aimed at raising awareness about colorectal health issues within the corporate environment. We partner with local businesses and wellness programs to provide expert speakers on the topic of colorectal health. Email us for more information about hosting a Rumpshaker at Work event at your business. Our inflatable colon display has traveled to over 100 health fairs and community venues since 2009 to educate our citizens about the need for regular colon screenings. We also participate in corporate health fairs with our new table top inflatable colon display. Email us if you would like to book either one of our inflatable colon displays for your corporate or community event. ​The annual Lisa Martz Charity Classic golf tournament benefits Rumpshaker's Lisa Martz Hope Scholorship Fund. Scholarships are awarded to local high school seniors and current college students whose families have been affected by colorectal cancer. 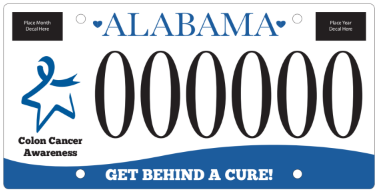 We are pleased to announce ​the first Alabama car tag to raise awareness about Colon Cancer will be in production soon!